The rendering of useful service is the common duty of mankind, and…only in the purifying fire of sacrifice is the dross of selfishness consumed and the greatness of the human soul set free. The secretaries here have an advantage I never had. They can prove to themselves their commercial worth. The success of each is dependent upon the success of the other. John Davison Rockefeller Jr. was born in Cleveland, Ohio, USA. He was an American businessman and philanthropist who was a prominent member of the Rockefeller family. 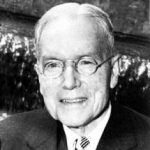 He was the only son among the five children of Standard Oil co-founder John D. Rockefeller. He earned a BA degree from Brown University in 1897. After graduation from Brown, he joined his father's business. He became a director of Standard Oil. He later also became a director at J. P. Morgan's U.S. Steel company, which had been formed in 1901. In association with his father, he created major philanthropic institutions, including the Rockefeller Institute for Medical Research in New York City, the General Education Board, and the Rockefeller Foundation. In funding construction of Rockefeller Center in Manhattan-one of few large privately funded development projects occurring in the Great Depression-Rockefeller created 75,000 jobs at a time of widespread unemployment in the 1930s.